The clock is ticking… You need to save money fast! The goal is to save $1000 in less than a month. Which is 100% completely doable. 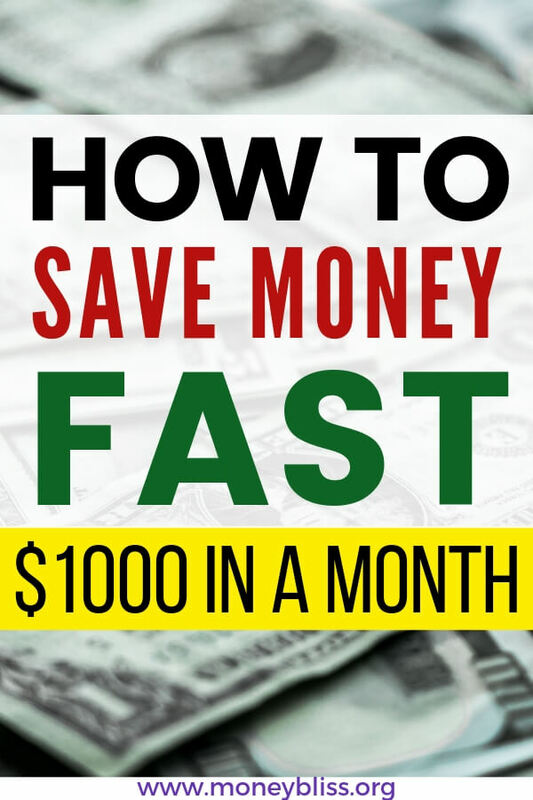 If you say, there is no possible way to save $1000 in one month than you won't do it. Set a goal and get ready to achieve it. Save $1000 in one month. Here is the great part… no matter how you handled money in the past, you can change your financial situation for the better starting now. True be told it may be easier than you think. The ongoing debate is it easier to spend less money or make more money? There are valid arguments on both sides of the coin. If you make more money, it will help you in the long run. You can save more money, pay down debt, and reach your financial goals. Why yes, making more money will improve your current situation, it may take time, energy, and money you don't have to dedicate like you need, too. If you spend less money, then the impact is immediate. There is more money left over in your checking account or in your cash envelopes. With spending less money, you are able to save money fast or pay off debt. Whatever your current financial goal will become possible. What side of the coin do you relate to? Spend less or make more money? 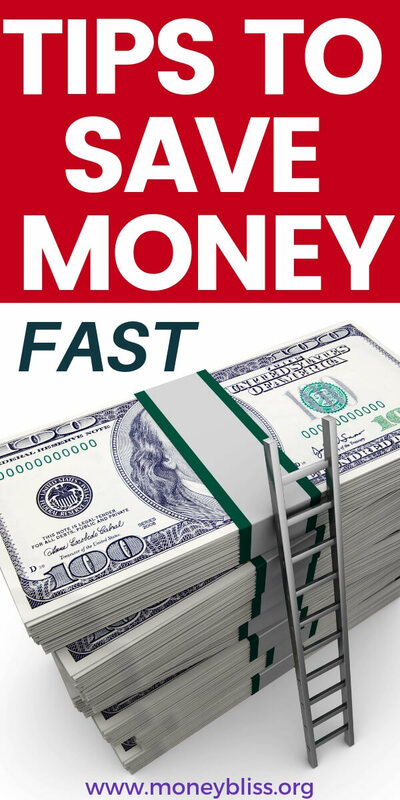 There are many ways on how to save money fast and get the $1,000 in the bank. Here is the honest reality… are you ready? 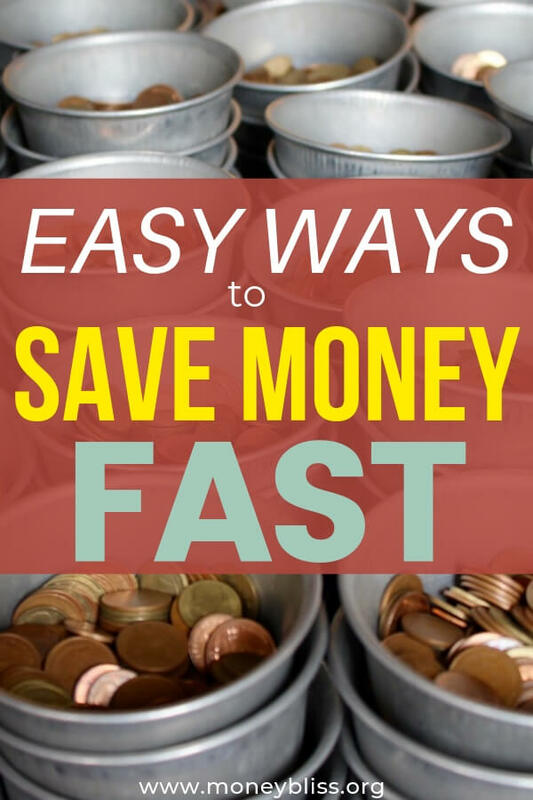 This list includes many tactics to help you learn how to save money fast. Some of them will make a larger impact on your financial situation quickly while others will take longer to see the difference. 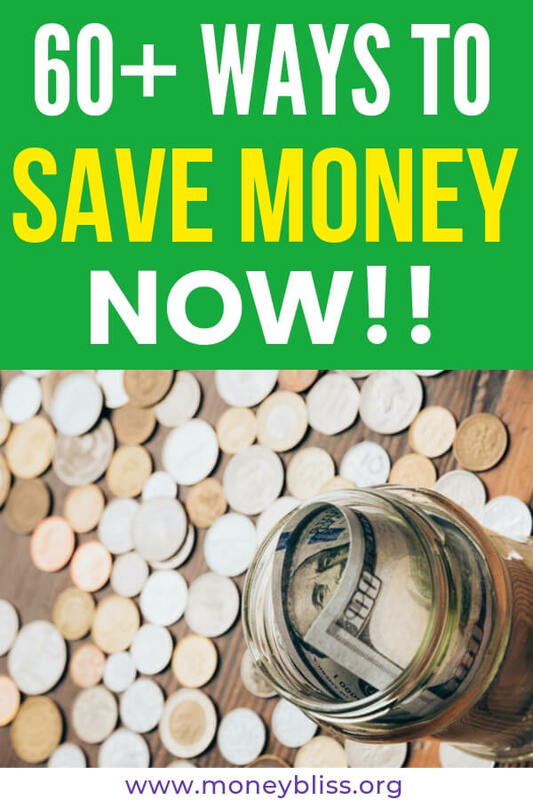 Don't even attempt to do all of these ways to save money at once! You will become overwhelmed and quit before you reach your first $100 dollars saved. Pick a few to start off with. Once you have mastered those, then move on to a few more tactics. The key to success is changing your lifestyle to something you can manage long term. To make this easier, I broke the ways to save money into various categories. This is probably the quickest way to save money. Your spending habits will determine your long term financial success. The more money you spend, the less money you have to save. Income must be less than expenses in order to save money fast. Let's dig into how to change your spending habits and start saving money fast. This is essential when the need is real to save money quickly. Not one extra dime (except those expenses need to survive). Just a hint…that latte in your hands isn't needed for survival. Make sure to read this on how to have a successful spending freeze. Try not to spend a penny until you reach your $1000 money saved goal. What is a discretionary expense anyway? Simply put… any type of expense that isn't necessary for survival. However, for most people, the spend more money on discretionary expenses because it is fun and they enjoy it. But, those extra expenses can wreck your budget and the ability to save money quickly. For a full understanding of how discretionary expenses fit into a budget, then the ideal household budget percentages post is a must read. Don't go to the mall – just to go to the mall. That removes 99% of the temptation to spend money. Every time you pull at your wallet, you are spending money. The less you use your wallet, the more money you are saving! Everywhere you turn someone is having a sale. We feel that if we miss a sale, then we miss a chance to save money. However, that is SO not true! You still have to spend money even if the item is on sale. The key is if you want to live a frugal lifestyle, you start to learn what items are cheap and what items are worth spending some money on. Just because your favorite store is having a sale. It doesn’t mean you have to buy it. Skip the purchase. Ignore the SALE! Have you ever considered why retailers make it so easy to store your credit card information on checkout? Then, you don't have a chance to walk away, get distracted and not finish your purchase. Thus, guaranteeing you will be spending money and not realizing you truly didn't need that item. Be proactive in your quest to save money fast. Remove all of your credit card information on all of your online accounts. Especially those favorite online stores you have a hard time resisting! Return items with the tag or still in the box. Walk away from the mall or any other tempting place to shop. Eliminate the temptation for impulse shopping. Use a Spending Wish List (found in our free resource library). While lifestyle changes will help to save money quickly, it will also help in saving money for many more years to come. For many, it may be hard to give up the life they have (or maybe even the life they are attempting to live, but just can't manage to keep up with the Joneses'). But, think about it… if you can save $100 each month, it adds up to $1200 each year. Over the course of 10 years, you saved $12,000. That is an awesome way to pay yourself first. Now, let's bump up making lifestyle changes and assume you save $500 each month, which equates to $6,000 in one year. In 10 years, that is $60,000. Definietly not cump change by any stretch of the imagination. Many things to cut on this list can easily save you at least $100 each month. In today's society, we are very blessed to have access to anything and everything we want at the drop of the hat. Many thanks to Amazon! However, as I am typing this, my trunk is full of items to donate. Plus another load of donation items is ready to go! Simply put… I am learning to live with less. Yet, things still manage to sneak their way into my house. However, I know that if I buy less things, then I am saving money. The Marie Kondo method has taken many people by storm (yet I was left unimpressed with my toddlers and their toys). Personally, I have enjoyed this book much more and it has actually kept the number of things in my house down. You don't have to go full minimalism to learn to live with less. Today, everything is moving to a subscription based payment methods. When you add up all of your subscriptions, it could be quite expensive. Decide for yourself… what is worth the cost? What could you live without and never look back? The average cable bill is $150 per month. Is that worth $1800 to you over the course of a year? Or are you happy to spend almost $5 a day on cable because it is less than catching the sports games at a local bar? However, you can watch almost anything on TV by picking up this plus it is a fraction of the cost of a monthly cable bill. I hate to call a repairman. Period. Learning handyman traits can save you a ton of money (especially if you own a house). Back in the day, these life skills were passed down through families. Nowadays, you can google almost anything and find many YouTube videos to walk you through the process. Worst case scenario… You can't fix something yourself and then you have to call a repairman for help. That might be this time, but next time you can do it yourself. For instance, my hubby figured out how to install this in our kitchen. Saving us a couple of hundred dollars. The same holds true for any type of service you can do yourself. Some examples include housecleaner, mowing, manicures, etc. Put all services on hold – specifically anything you can do yourself. If you look, you can find free things to do ALL. THE. TIME. Having fun doesn't mean you have to spend money! Going to the park with kids can be just as fun as the jump place that sets you back $50 a pop. Enough to keep you entertained for days! Maybe you aren't ready to cut the cord or drop your cell phone service. That doesn't mean you can't negotiate. It is one of the simple ways to save money quickly. Review insurance policies to see if you can save money with a new company. Maybe look at increasing your deductible. Negotiate contracts for cable, internet, and phone. Also, you can pause many of these services just to test if you can live without it. You can also you a service like Trim, which is free to use to save you the time and hassle of doing it yourself. Drive less. Walk or bike more. Combine errands into fewer trips. Slowly accelerate when driving. Stay below the speed limit. Shop with cash. Pick up one of the best cash envelope wallets. Leave earlier to avoid paying tolls. One of the easiest ways to save money fast is with your grocery spending. While this may not be true for 5% of people, the other 95% of us will benefit. For most people, their grocery budget is one of the top spending behind housing, taxes, medical, and maybe debt. It is SO DOABLE to lower the grocery budget and still eat healthy. Eat at home. Don’t go out to eat. This includes fast food or takeout. We have been trained the cooking at home is a lot of work and what we cook doesn't taste the same as eating out. Most of the time that isn't true. However, there may be a time when dinner doesn't turn out the way we expect. (That happened to us last night.) But, we move on and remember how much we are saving by eating at home. Plan your calendar, so eating at home becomes a reality! Obviously, since the plan is to eat at home, then meal planning is a necessity. Don't over complicate things here. That is why most people give on learning to meal plan. Here is a full guide to Meal Planning 101. If you are new to meal planning, I recommended using a meal planning subscription for a month or so. Until you get the hang of it. The long term goal is to make these new habits stick and save money for many more weeks to come! Let's face it… 95% of households have food in the house. They just don't want to eat what they have in the cabinets and freezers. Yep, totally guilty of that one too! In order to save money quickly, eat out for your cabinets and freezer first. Get creative! Continue until you actually need to buy groceries! And then, maybe continue to eat the staples in the freezer and cabinets and only buy fresh food. Oh my! The cost of eating out at lunch. Many workers (and school kids) feel the pressure to eat out with their colleagues (and friends). This can add up fast! And is a way to save money quickly! Brown bag a lunch for work. Pack a lunch for kids, too! Let's look at the cost… Cost of lunch is $10. Take that by 5 times per week and it adds up to $50 per week. Over the course of a year, $2600 is spent! That is one the quickest way to save money! For schoolkids… The average cost of school lunch is $3.50 and most kids are in school 180 days. That works out to be $630 per school year per kid. Of course, some of the savings above will be spent in providing a brown bag lunch to take. It can still save you $300-1300 per year per person. Those pennies quickly add up! I'll admit I am guilty of shopping too much! I am missing an ingredient, so I run to the store to pick it up, and oh, the couple of others things I need, too. This habit can balloon your grocery bill by 25-50% each and every time. Decide in advance how much you plan to shop and where. Stick to it. I'll be honest… when we are at a potluck and I see produce that is out of season produce and the person who bought it is complaining about the grocery bill, it makes me want to cringe. This is such an easy way to save money fast on groceries! Buy produce in season! Plus you get the health benefits of eating a more well-rounded diet. Learn more about what produce is season and when here. Skip the coffee cart wherever you go and make your own coffee at home. Even better, drink the free coffee at work. Say no to happy hour. Does Eating Healthy Truly Cost a Fortune? These ideas on how to save money quickly are plain simple. Not complicated. Not difficult. While they may or may not produce thousands of dollars saved, these money saving tips will help you save money. There is a cost that comes with convenience and typically it is a pricey one too. ATM fees! Go to the bank. Pre-cut fresh or frozen fruits and vegetables. Cut showers short by a couple of minutes. Only run the washer machine and dishwasher when there is a full load. Turn down the heat in the winter and A/C up in the summer. Invest in a charging station for all handheld devices. Charge them at the same time. Stop using paper towels. Switch to kitchen towels or washcloths. Stop buying plastic baggies. Switch to reusable food containers. Use dryer balls instead of dryer sheets. Drink water. Invest in a water filter if necessary. Carpool to work or school. Change the direction on all ceiling fans when the seasons change. Sign up all family members for birthday rewards! Free stuff. Life is not giving you a break. You can't stop living paycheck to paycheck. In all honesty, trying to overcome when ends don't meet seems impossible. Remember, this is a season and with persistence, hard work, and effort you can get through it. Pay minimum payments on debt. Stop retirement contributions – just for now. Go around again to sell items from your house. Dig deeper. Check your state to see if you are owed any unclaimed money. Stop accumulating more interest on credit cards and look into a zero interest credit card. The fastest way to save money is to pay yourself first (and put the money where you can't access it easily). For us, that means an online savings account. Paycheck in and automatically money is transferred out. It helps us to be consistent with saving money. Plus the temptation to spend money is gone. No money to spend when you don't have any available. That is the fastest way to save money – pay yourself first. Period. Now, what tactics to you plan to implement in order to save money fast? ?